Telescopes concentrate the light of distant objects and deliver it to a focal plane, but then specialized instruments are required to analyze that light in order to actually do the science. 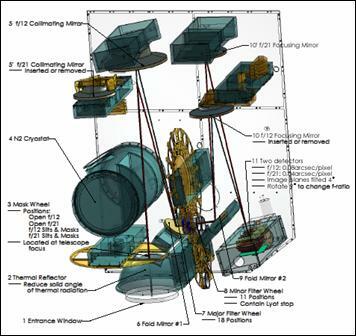 MSU�s first contribution to the suite of world-class instruments that will be mounted on SOAR is the Spartan Infrared Camera, an innovative imager with an unprecedented number of detector pixels covering a large area of the sky at high angular resolution. Since SOAR�s sharpest images and therefore its highest performance will initially be achieved at near-infrared wavelengths (1-2.5mm), the Spartan camera will be SOAR�s leading-edge instrument. The drawing shows the interior details of the Spartan Camera, illustrating that although this is a complex opto-mechanical system that must work at liquid-nitrogen temperatures, there is an underlying elegance and simplicity to its design that is a harbinger of good performance to come. The camera contains two alternate sets of optics, providing a choice of two magnifications covering either the largest possible field of view at slightly lower angular resolution, or a two-times smaller (in diameter) field of view at SOAR�s maximum angular resolution of 0.04 arcsec. Incoming light from the telescope is collimated and then refocused by pairs of convex mirrors, onto an array of four 2048x2048 pixel2 HgCdTe detectors. This will be the largest infrared detector array that is available anywhere in astronomy.